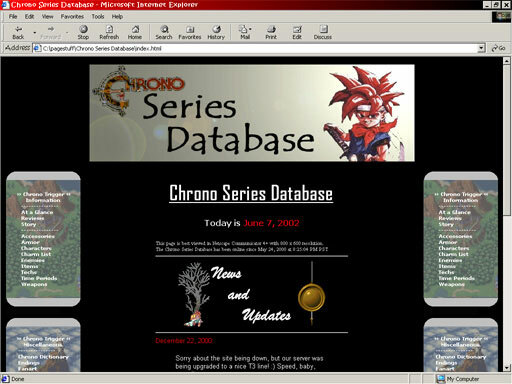 Our goal is to be the most comprehensive Chrono page on the internet, and we are constantly looking for more ways to expand in order to make that goal a reality. Over the years, this site has undergone numerous cosmetic and content-related changes. This page briefly covers each version. 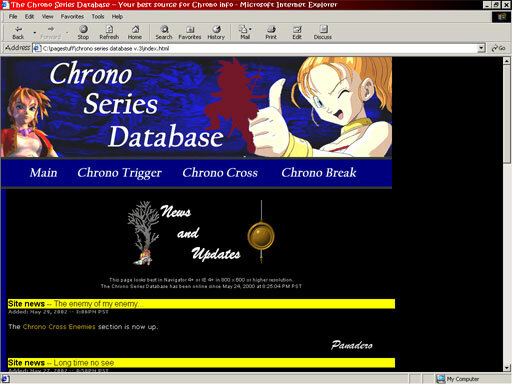 The first version of the page only covered Chrono Trigger. 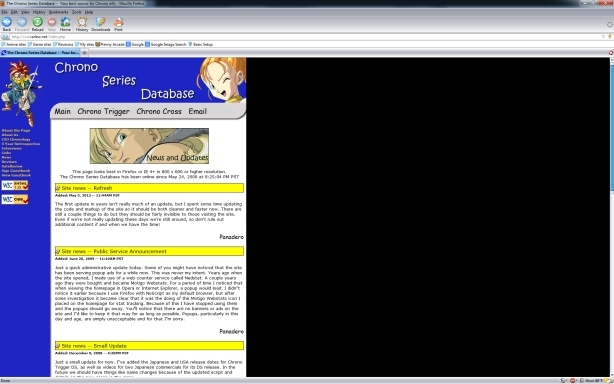 The menus on the right were copies of the menus on the left, to make room for Chrono Cross information. 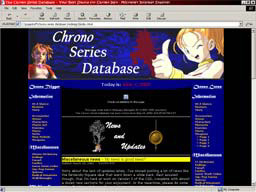 (Work on Version 2.0 started before Chrono Cross information was readily available.) In fact, not all of the sections were completed before Version 2.0 was uploaded. Version 2.0 was a vast improvement over Version 1.0 in both design and content. 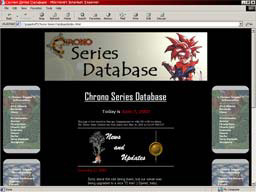 Both Chrono Trigger and Chrono Cross were fully covered in areas such as reviews, armor, characters, enemies, etc., and multimedia such as pictures, midis, winamp skins, icons, etc. were provided. 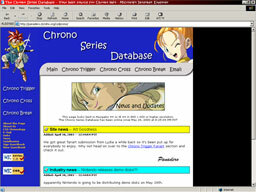 When news for Chrono Break came out, it became apparent that the two game column design of Version 2.0 would not work anymore. Version 3.0 addresses this problem and thus allows sequels to be added easily. New sections for Version 3.0 include book information and sheet music for Chrono Trigger and Chrono Cross, redesigned Chrono Cross character and enemy sections, Chrono Cross merchandise information, as well as comprehensive information about Chrono Break. Version 4.0 was a radical change for the CSD in terms of both site structure and design. The largest change of all was the transition from straight HTML to PHP, which greatly helped increase ease of expansion and overall flexibility. This version was the first to be XHTML 1.0 Transitional validated as well as CSS 3.0 validated. New sections included tabs of various Chrono songs, game credits, sprites and more, as well as beefed up fanart, fanfic, skin, and other multimedia sections. Version 5.0 was purely an "under the hood" change, as it made the move from PHP to ASP.NET and the Microsoft development stack. 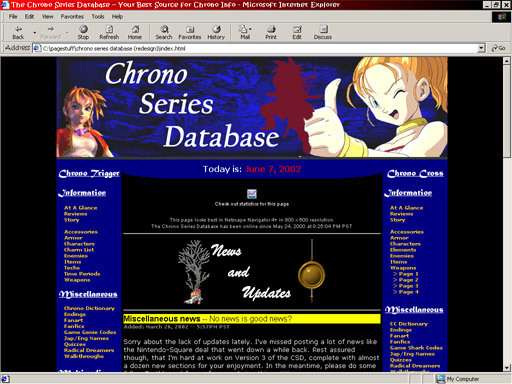 The site's design, scripts, and resources are mostly preserved as-is to serve as a reminder of what the site was in its heyday.